Your sunroof can be opened or closed electrically when the ignition switch is in the “ON” position. 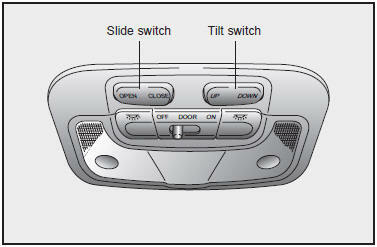 You can slide or tilt the sunroof by depressing the corresponding switch located on the dome light assembly. To tilt the sunroof, press “UP” on the tilt switch located on the dome light assembly. To close it, press “DOWN” on the tilt switch. To slide the sunroof, press OPEN on the slide switch located on the dome light assembly. Hold the slide switch until the sunroof reaches the desired position then release the switch. To close the sunroof, press CLOSE on the slide switch and hold it until it is closed completely. To use the autoslide feature, momentarily press the “SLIDE OPEN” button on the overhead console. The sunroof will slide all the way open. To stop the sunroof sliding at any point, press any sunroof control button. The sunroof is made to slide together with sun shade. Make sure that sun shade is not closed when the sunroof is open. Release the switch button as soon as the sunroof is fully opened or closed. If kept on, the sunroof may be damaged. Make sure that the sunroof is fully closed when leaving the vehicle unattended. Never stick your head, arms, etc. out of the sliding sunroof.